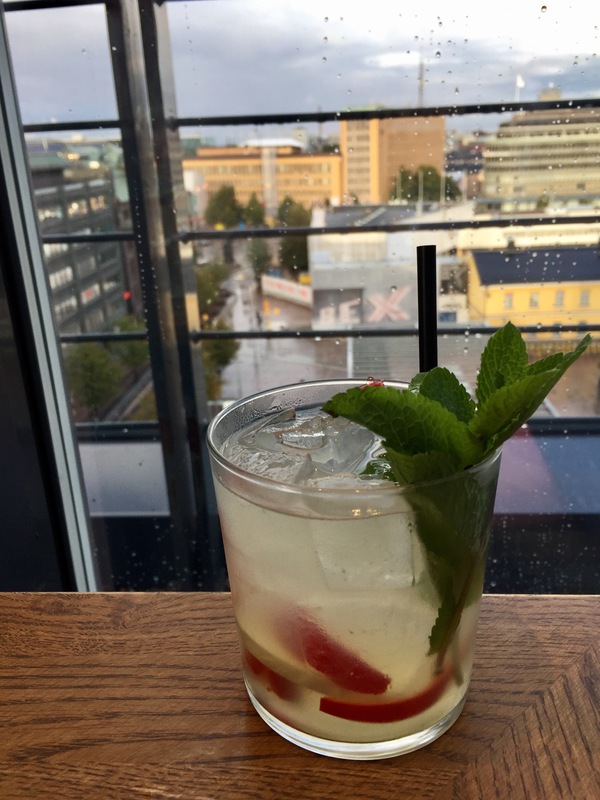 HOKU was opened on the 3rd of December 2016, when new restaurant concept was launched in Kamppi shopping center at 5th floor. Area is called Kortteli (Block), which includes 11 restaurants with different cuisines, HOKU being one of them. Restaurant HOKU is a Hawaiian restaurant started by Ryan Shibuya. It is located by the windows opening to Narinkkatori offering great view, if you get window table. So ask for it, but enough early. Some of the tables are on the other side closer to other restaurants like Beijng8. Visited again HOKU one week before Christmas. We were the last ones to get table, without table reservation. After us restaurant was fully packed. For starters ordered POKE SAMPLER Fresh siika and salmon, kaiso wakame, sweet onion, soy-wasabi and spicy mayo dressing and OKONOMIYAKI (v) Savory Japanese pancake, cabbage, onions, tiger prawns, served with okonomiyaki sauce, mayonnaise, crispy prosciutto. Fish sampler consisted of two towers flavoured with different spices. Whitefish is Finnish lake fish and eaten as “raw” especially in the Christmas time. Salmon is also typical to be eaten as spiced during the holidays. Sampler was delicious and spiced enough strongly and this seemed to be new trend since last visit. Okonomiyaki can be ordered as vegan version. Prawns and prosciutto are replaced with Silken tofu and asparagus. Very tasty and enough well spiced. From several main courses ordered BI BIM BAP Thinly sliced beef teriyaki, lightly cook and pickled vegetables served on rice with a fried egg and spicy kocuchung sauce and TOFU TERIYAKI Pan seared with teriyaki sauce. Served with rice, green or potato salad, pickles. Bi Bim Bap has actually roots in Korea, so the Asian fusion cuisine has also arrived to HOKU. Dish was tasty, beef tender and sauce paired well with all ingredients. Could have left the egg out, but if one eats only main course it may be needed add-on. Vegan version did not include potato salad, it was replaced different vegetables. Dish was well prepared and delicious. Only problem with the vegan dishes is, that one has to eat tofu two times, unless you order Emadame for starter. Wines are really affordable when it comes to restaurant prices. If you get bottle of decent wine under 40€ in Finland, then you are on right track. That is one reason why I can recommend HOKU. Ordered this time full-bodied Mouth Bomb, which is produced by Casa Vinicola Winepunk in Toscana, Italy. The variety of grapes, Merlot, Syrah, Cabernet Sauvignon, Ciliegiolo, Grenache and Sangiovese are the reason for name. Excellent wine for the dishes we ate! Restaurant Hoku has been a success. Excellent location in the Kamppi shopping center and window tables at 5th floor with great view help it also. But of course food is the most important part and it was tasty. Must say that using of spices made the enjoyment even better than last time. 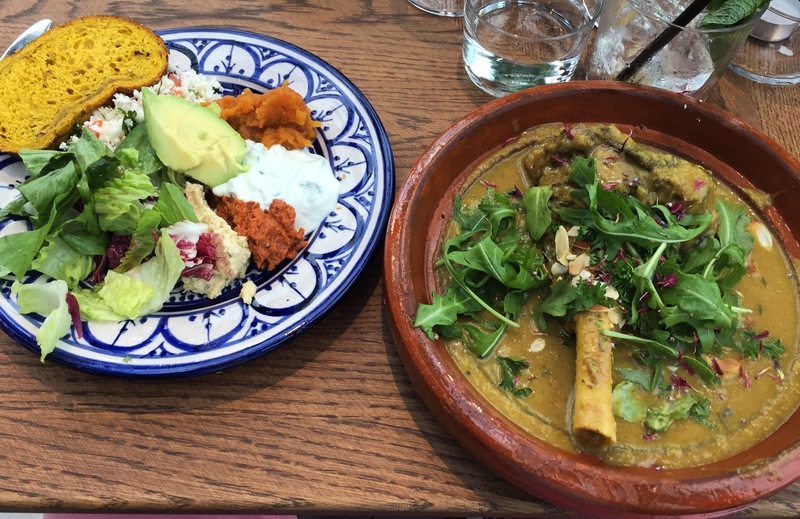 Then spices were more mild when it comes to both starters and main courses. Service was professional being not too formal. Style suits well to casual athmosphere. Saw many customers trying to walk in without table reservation without luck. Therefore make the table reservation enough early. Restaurant Sandro Kortteli is the third Sandro restaurant in Helsinki. 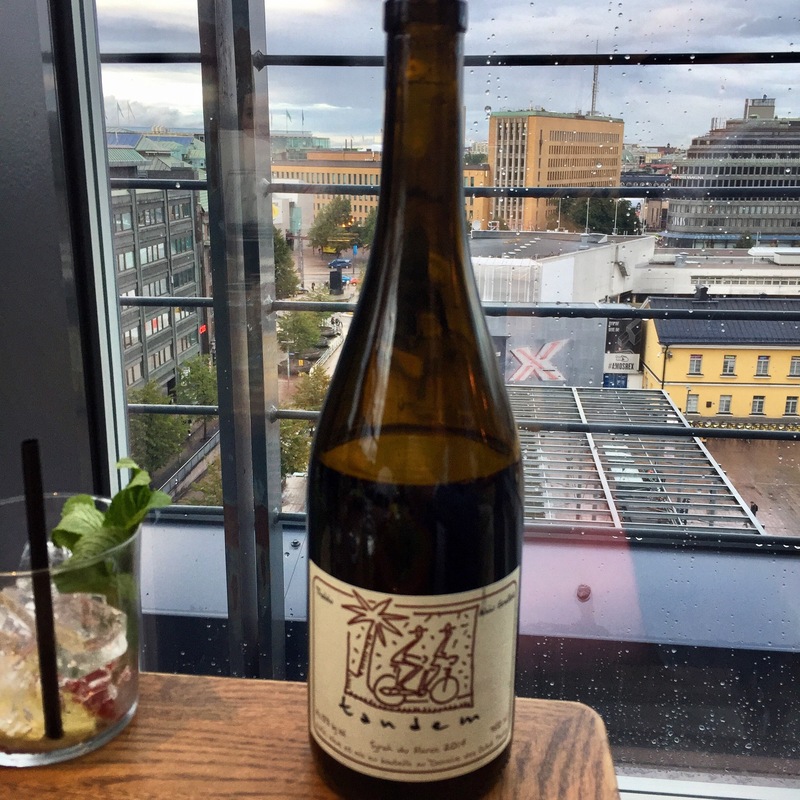 It was opened on the 3rd of December 2016, when all other restaurants in the “block” were opened in Kamppi shopping center 5th floor. 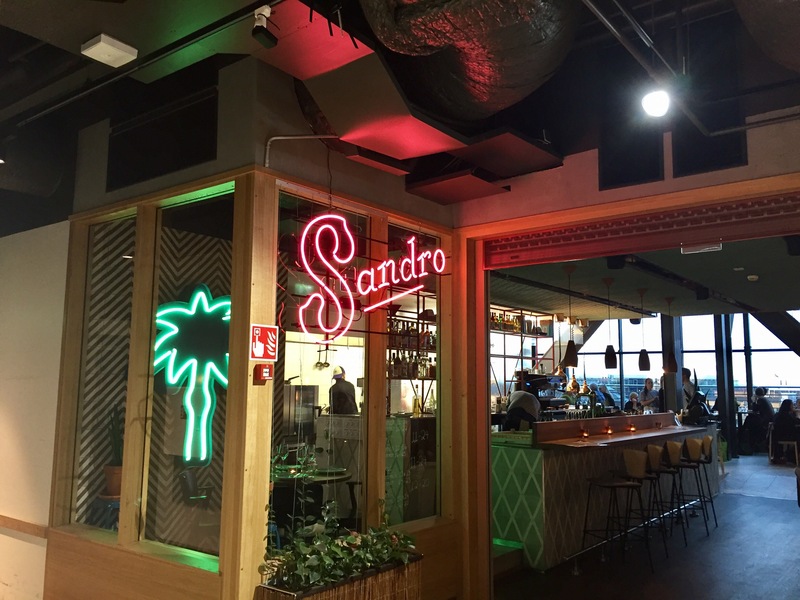 In August 2017 4th Sandro restaurant was opened in Tapiola, Espoo. 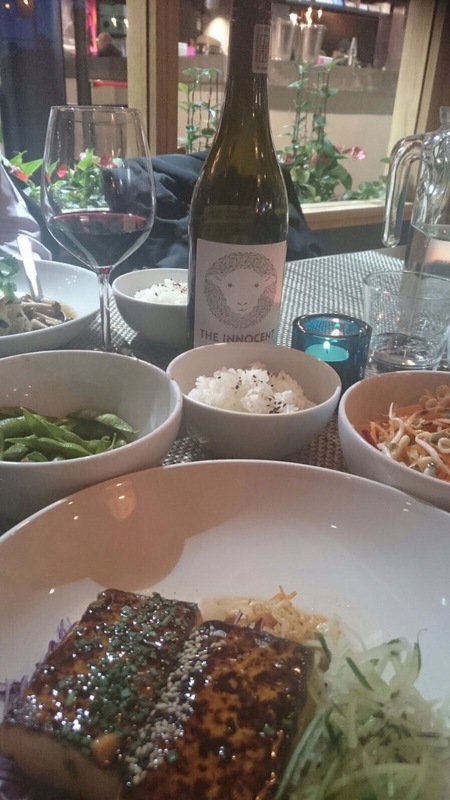 The first Sandro in Kallio suburb was established in 2013 and it started the triumphal leading to more openings. All Sandro’s serve African style, mostly Moroccan, food. Brunches and buffet’s are most popular. In Kortteli, Marrakech Madness Feast, seemed to be mostly chosen portion from the menu. It included starters, main courses and desserts at the price of 33,90€. Recommend to order that instead of dishes from a la carte list. Reason for this is, that there are not actually starters on menu and main courses are quite expensive. Anyway started the dinner with aperitives called Flower Mule. Very refreshing and tasty drink, which included cucumber, chili and ginger. For main courses, as there were no starters, ordered Tajines. African Sweet Potato Curry coconut, organic tofu, chili and coriander as vegan dish and Slow Cooked Lamb Shank ginger, cinnamon, chili, prunes, sesame and almonds. All Tajines come with baby gems, tzatziki, harissa pesto, hummus, cinnamon pumpkin, cauliflower tabbouleh, couscus and saffron bread. The curry was the only vegan option on the menu. It was spicy, but the serving size is quite big, so after a while the taste is overwhelming to the taste buds. 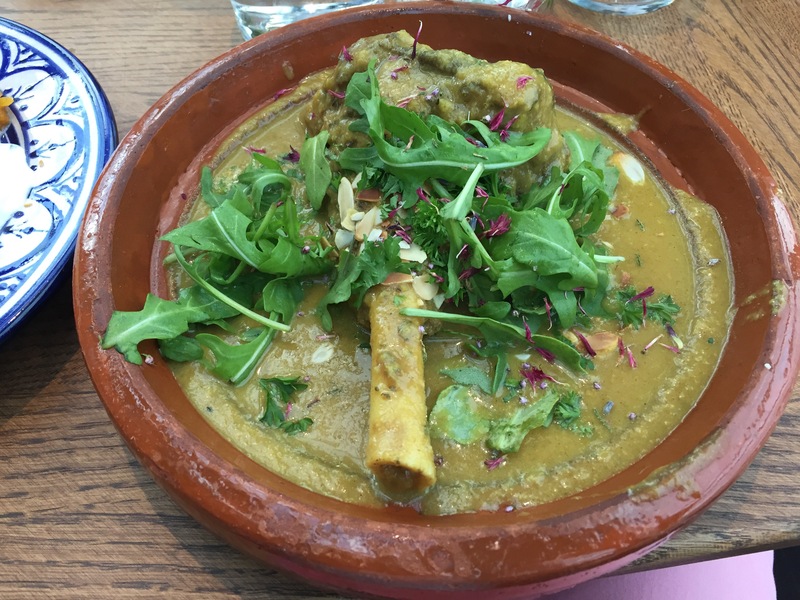 Must say that Lamb Tajine was dissappointment. The sauce sounded tempting when reading what it consisted. But could not find any of listed spices from the taste. Luckily lamb was well prepared and crisp, which compensated a lot. With many side dishes one can taste different flavors from Morocco. However, value more strong and deeper savors. Wine list is short and quite expensive for casual restaurant. One wine under 40€ and most cost 60€ or more. Ordered French-Moroccan Tandem Syrah 2014. Alain Graillot, a highly respected grower in Crozes-Hermitage in the Rhône, met the owners of this North African domaine while on a cycling holiday in Morocco and now they make this wine in tandem. That is how the name was invented. Wine paired quite nicely with food enjoyed. Sandro restaurants have been popular since opening. Chain is part of Royal Ravintolat group which has changed it’s profile from traditional fine dining chain to co-owner of restaurants serving more diversified and casual dining experiences. 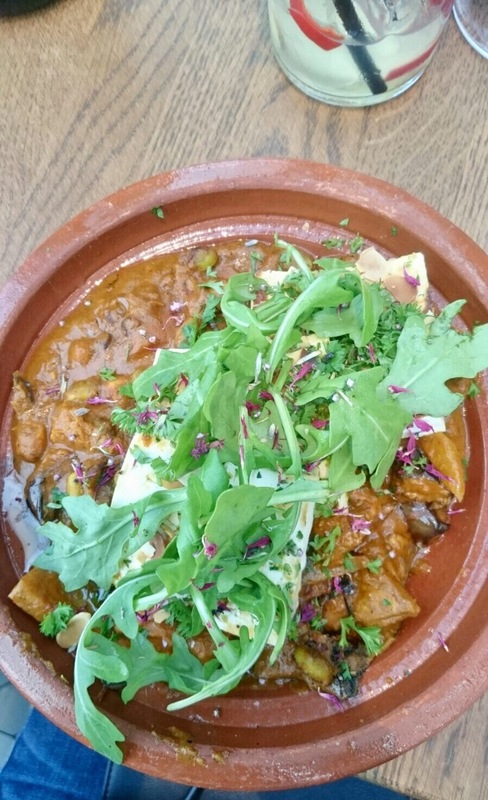 Food in Sandro Kortteli could have been more spicy when it comes to Lamb Tajine. On the other hand curry had enough kick. Service was professional, but is seemed that waiters were quite busy. Ask for window table and you can see Narinkkatori and buildings around Kamppi. Location and view restaurant can offer, is one of the draws Sandro Kortteli has. 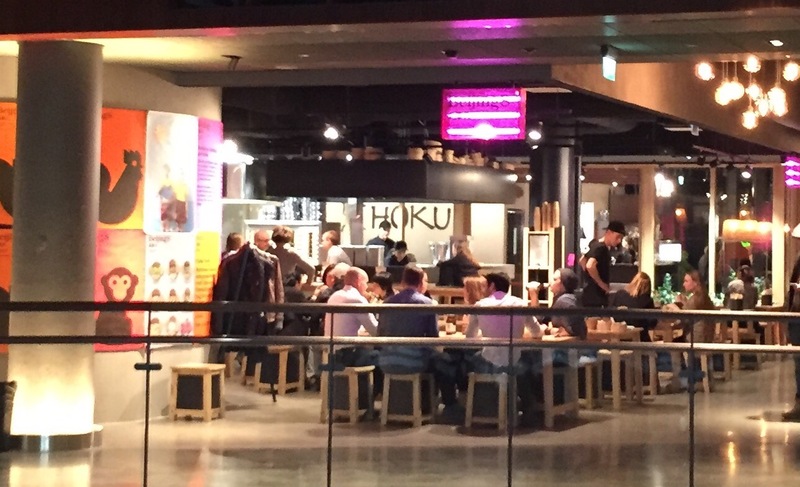 HOKU was opened on the 3rd of December 2016, when new restaurant concept was launched in Kamppi shopping center 5th floor. Area is called Kortteli (Block), which includes 11 restaurants with different cuisines, HOKU being one of them. Restaurant HOKU is a Hawaiian restaurant started by Ryan Shibuya. It is located by the windows opening to Narinkkatori offering great view if you get window table. So ask for it, but enough early. Some of the tables are on the other side behind glass walls after Beijing8 restaurant. 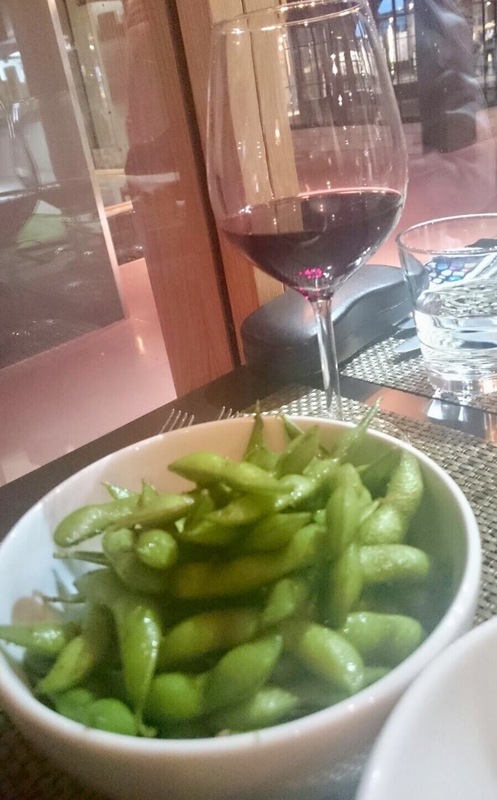 Edamame, which is common in Hawaii, was a very simple dish, and a bit lacking imagination. As tasty as the sauce is, at the end they are just soy beans. Suitable for snack to be shared but maybe not for starter. Crab was delicious and actuallu quite big for starter. 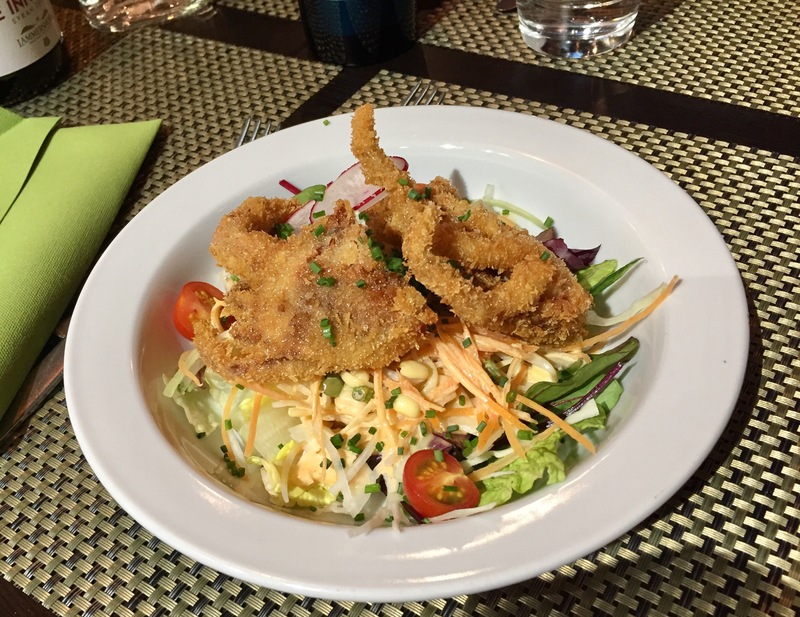 Crispy shells with tasty salad made this crab starter maybe the best of all dishes eaten. 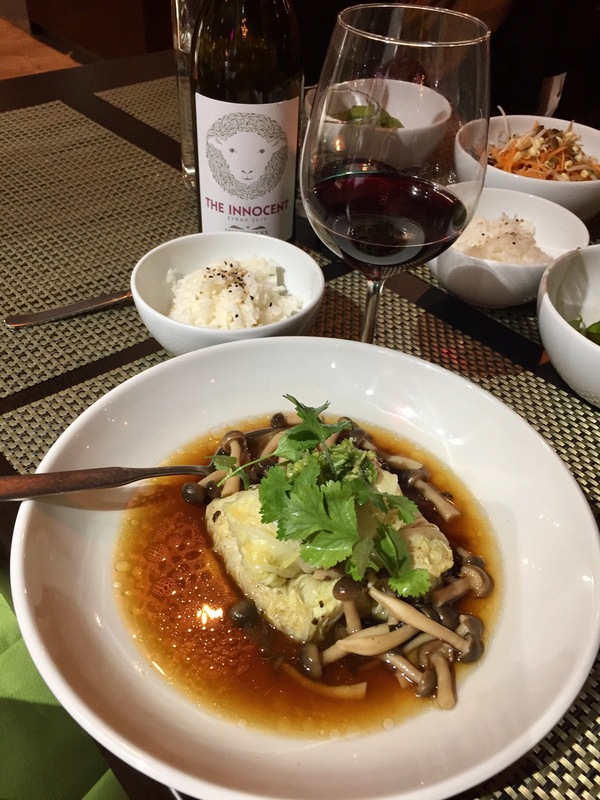 From several main courses ordered STEAMED SEABASS WITH BLACKBEANS Seabass steamed in cabbage leaf, salty black beans, shimeji mushrooms, ginger pesto and TOFU TERIYAKI Pan seared with teriyaki sauce. Served with rice, green or potato salad, pickles. Seabass was wrapped in cabbage leaves, 3 pieces, which make portion generous. Sauce or soup was quite salty but rice lightened it. Fish itself was perfectly cooked, soft and tasty. The tofu was silken, and pair well with teriyaki sauce. In menu dish is with salmon but can be replaced with tofu. In the plate there are 3 different flavors, sweet with the red cabbage, sour with the pickles and chilli with cabbage. The green salad is simple, usually served with a mayo dressing, but as it was served as vegan, the dressing was a vinagrette. Wines are affordable when it comes to restaurant prices. If you get bottle of decent wine under 40€ in Finland, then you are on right track. 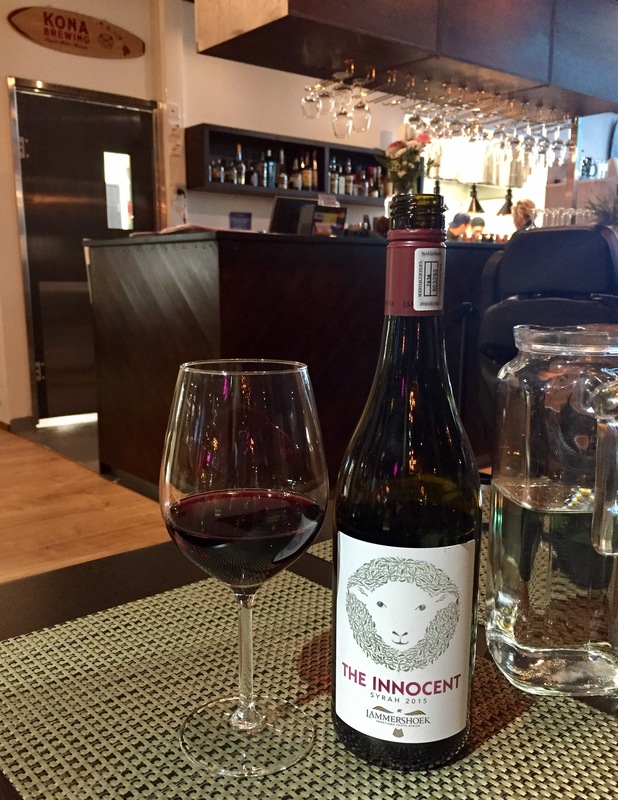 Had South-African The Innocent Syrah 2015 from wineyard Lammershoek. The palate was soft and round upfront mouth feel. Quite light for Syrah but paired well with Hawaiian style food. Restaurant has it’s own beer as you can see from the picture below. One of the Hawaiian islands, Kona, can be seen on the sign behind bar desk. Restaurant Hoku will be success for sure. Excellent location in Kamppi shopping center by the windows with great view help it also. But of course food is most important part and it was tasty. Especially not too strong Hawaiian flavors should melt Finnish mouths. Service was professional being not too formal. Saw many customers trying to step in without table reservation. On Saturday evening restaurant was fully booked. 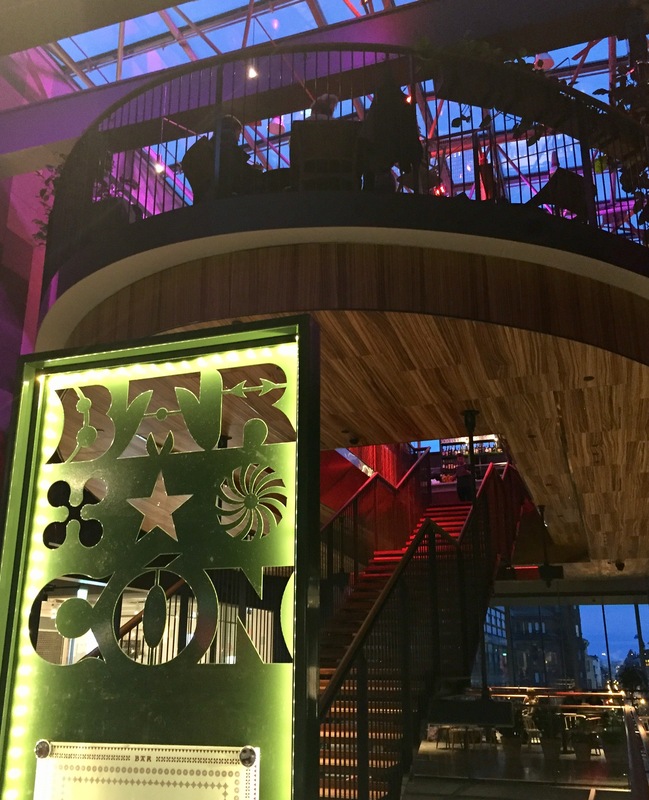 Bar Con was opened on the 3rd of December 2016, when new restaurant concept was launched in Kamppi shopping center 5th floor. Owners of Bar Con were also behind the new concept, Kortteli (Block), which includes 11 restaurants with different cuisines. Bar Con is, however, located in its area above other restaurants and cafes. You climb the stairs to the “6th” floor where is the dining area and bar behind the desk. 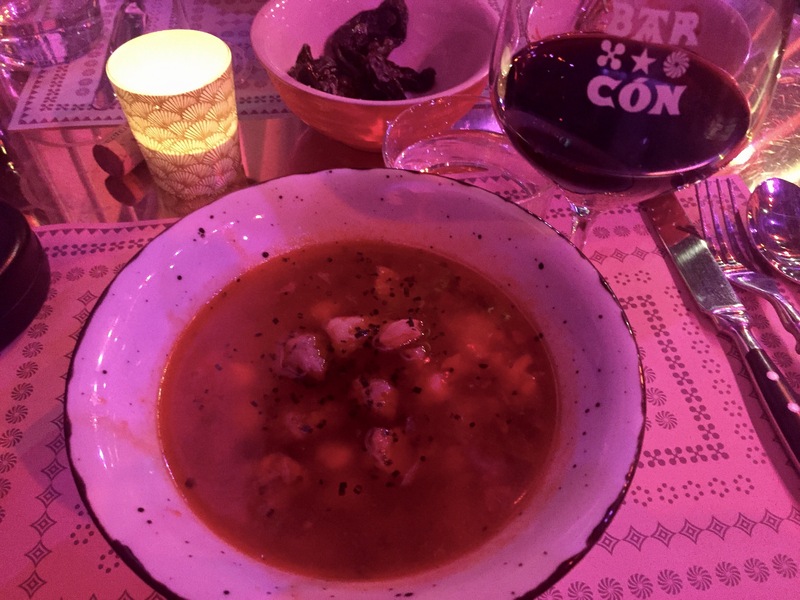 Restaurant Bar Con is relaxed and casual spot serving similar food as you would get in Barcelona tapas bars. 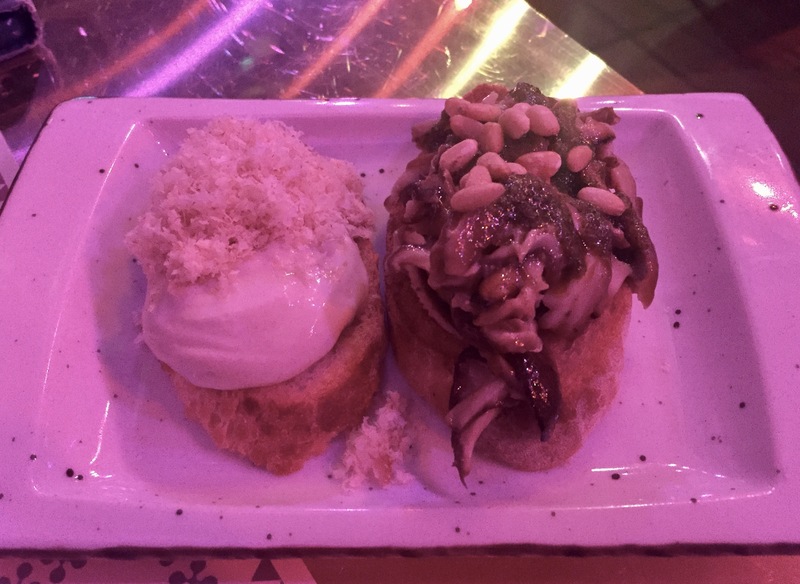 Menu includes pintxos, which are served on a crunchy slice of bread, tapas and main courses. Also few desserts are included. Started the dinner with 2 pintxos and 2 tapas. Pintxo is snack, one piece costs 4€. Tapas portion can be shared. Ordered QUESO AZUL Y NUECES Asturian La Peral blue cheese with walnuts and SETAS AL AJILLO Seasonal mushrooms sauteed with parsley, garlic and pine nuts. Amount of cheese was overwhelming but could not find walnuts. Would prefer blue cheese as slightly melted but this pintxo was delicious. The garlic taste was a bit overwhelming, but overall it was a nice little snack. 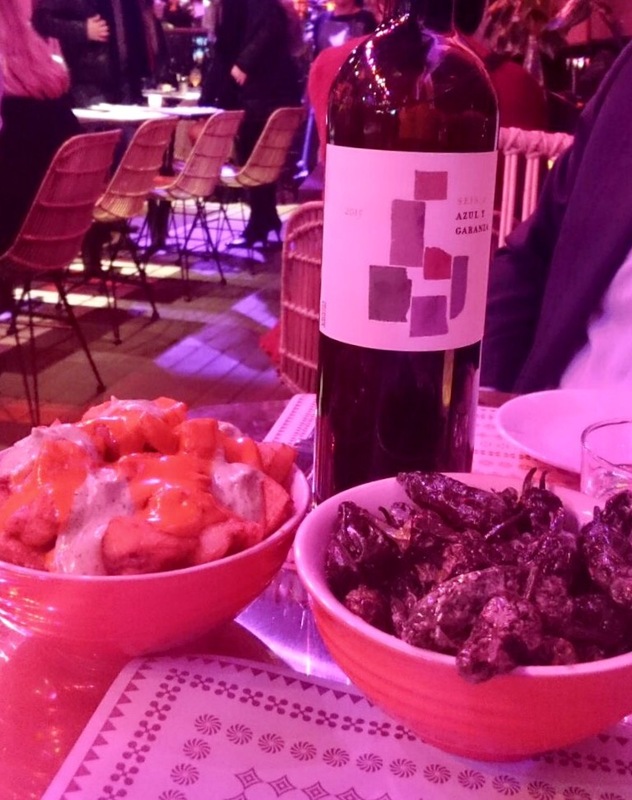 Next came tapas portions, had ordered PIMIENTOS DEL PADRÓN Green Padrón peppers fried in olive oil and seasoned with coarse salt from Ibiza and PATATAS BRAVAS DE BARCELONA Crispy potatoes, spicy sauce made of smoked pepper and aioli. One tapas plate is enough for two person for starter, if you order first pintxos. Spiced potatoes were excellent, but missed a little bit taste of chili, which is used in some tapas bar in Barcelona. Also salted green sweet peppers were as they should be. 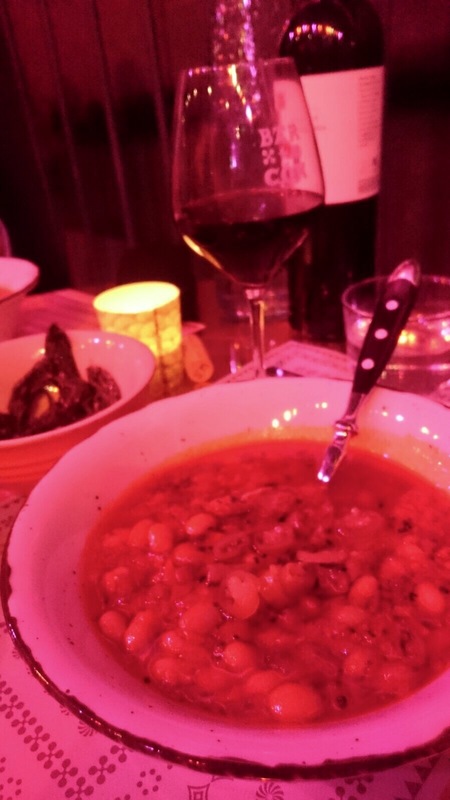 For main courses decided to ordered MAR Y MONTAÑA Chickpeas, Spanish butifarra sausage and baby squid and POCHAS A LA NAVARRA White bean and vegetable stew from Navarra. Mar was now shrimps instead of squid as restaurant was not able to get fresh octopus. Better this way than to serve frozen food, which can be quite stewy when it comes to squids. Butifarra sausage was as good as expected and stew very tasty as a whole. The white bean stew was the only vegan choice. This dish was a bit too salty, but must wonder if the combination of tapas on top of this main would have made a difference on the taste. Overall a nice warm dish. Wine list consist of Spanish wines, of course, and most of the wines are from small producers and imported by the company owning Bar Con. List also tells that wines are vegan, which means that animal-derived products has not been used during production. 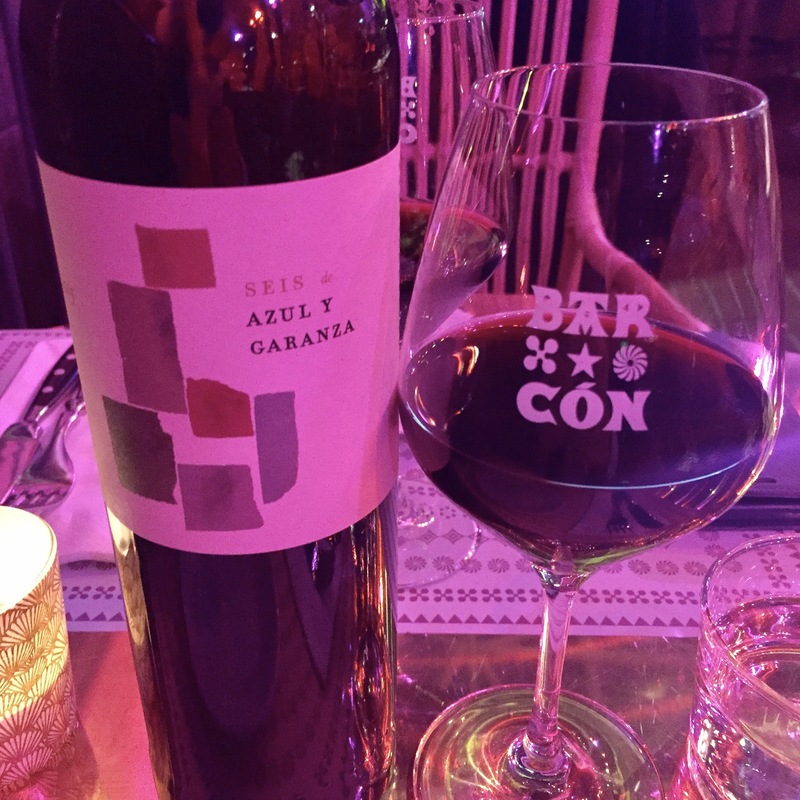 Ordered Seis de Azul y Garanza, which has its origin in six vineyards placed next to the Desert of Bardenas Reales which produce small grapes. Waiter suggested this wine for all dishes we had ordered and pairing was perfect. Cabernet Sauvignon and Merlot were perfect combination. Restaurant Bar Con will be success, no doubt about it. Perfect location and you can even watch out from the narrow bar. Food is tasty and ingredients used fresh and original, imported from Spain. Must say that so far most authentic when it comes to real Spanish food. Service was professional and seemed natural. Information about food and wines were available with professional way.